You don’t want to miss this! 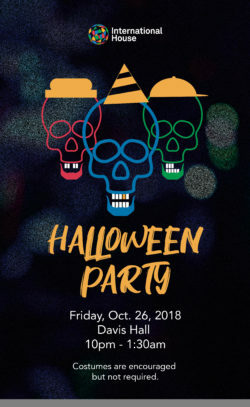 Join us for a night of pre-Halloween FUN! * Costumes are optional* We hope to see you there! ** Please note, outside alcohol is prohibited! Public Safety will be on site monitoring the event – they will confiscate ALL alcoholic beverages not purchased from International House and you will be reprimanded and escorted out. Thank you so much for abiding by our rules!